May 21 was a busy day for Presiding Bishop Michael Curry. He appeared on ABC’s “Good Morning America” and “The View” and NBC’s “Today” to talk about the royal wedding. [Episcopal News Service] May was quite a month to be an Episcopalian. 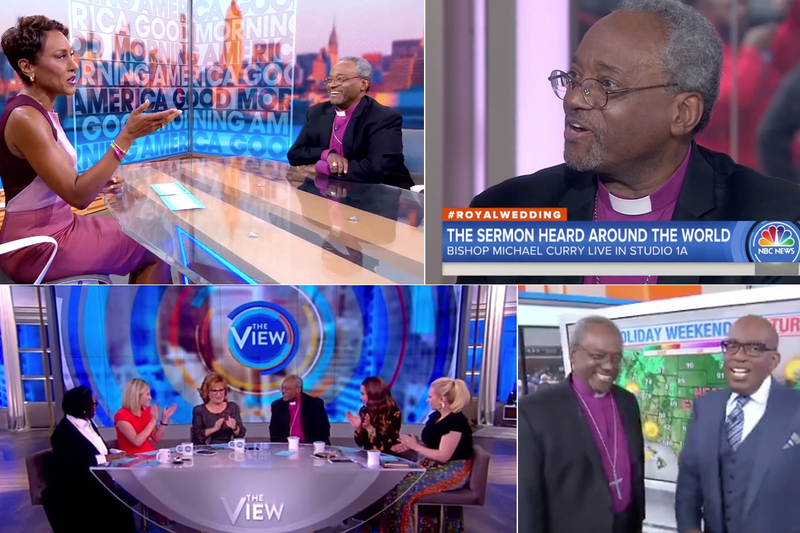 For the week leading up to the royal wedding, people across the world wanted to know everything about Presiding Bishop Michael Curry, including why the leader of the Episcopal Church would be preaching in the presence of the queen of England. 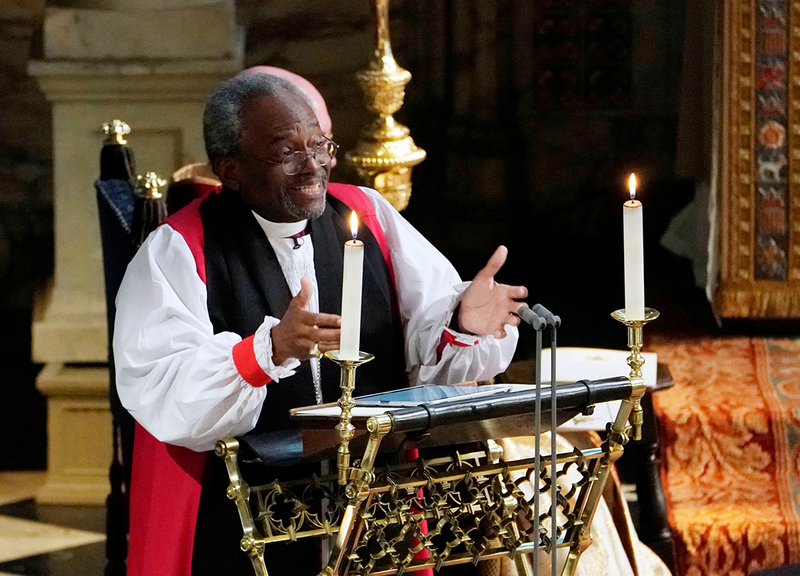 Then on May 19, nearly 30 million TV viewers in the United States alone watched Curry’s sermon on the power of God’s love at the wedding of Prince Harry and Meghan Markle. For a week afterward, Curry was interviewed or profiled by seemingly every major media outlet, from the BBC to ABC’s “The View” to the celebrity gossip site TMZ. Episcopalians, who have long known of Curry’s talent as a preacher, responded with a mix of joy at “one of us” receiving such attention and hope that Curry’s rising profile would boost the church’s profile – and maybe even help fill the pews. “I think you can’t discount just the kind of euphoric pride that Episcopalians felt,” said Melodie Woerman, communications director for the Diocese of Kansas. After the royal wedding, posts about Curry on her diocese’s social media accounts generated a level of intense interest “like I had never seen before,” she said. Curry did his part to seize this opportunity for evangelism, deliberately turning the conversations in interviews back to Jesus’ message of love’s power to change the world. And days after the royal wedding, in a bit of scheduling serendipity, he joined other ecumenical Christian leaders for a “Reclaiming Jesus” church service, procession and candlelight vigil in Washington, D.C. Though planned long before Curry was asked to preach at Windsor Castle, those events, held on May 24, drew additional news coverage due to his sudden star power. Of course, news cycles don’t last forever. If Curry was granted his Warholian 15 minutes of international fame, he succeeded in extending it by several days. But he, the church and Episcopalians now are faced with the question, what’s next? Curry was a viral internet phenomenon once before. His 2012 sermon at General Convention generated plenty of attention within and outside the church and led to his book, “Crazy Christians,” though he has no immediate plans to write a new book now that he is known as the royal wedding preacher. He is more likely to pen opinion pieces on Christian themes for news outlets, “if it helps the cause of spreading the message,” he said, though the most certain next act for the presiding bishop is simply more of the same. In addition to preparing for the 79th General Convention this July in Austin, Texas, Curry will do what he always does: spend most weeks traveling to various dioceses, meeting with Episcopalians and preaching. He is scheduled to appear at the Diocese of Albany’s annual convention June 8 to 10 in Albany, New York, and will follow that trip by spending four days in the Diocese of Olympia, with several public events in and around Seattle, Washington, starting June 14. Discussion of the royal wedding will be unavoidable but far from the only topic. Curry is scheduled to preach June 14 at St. Mark’s Cathedral in Seattle and again on June 17 at St. Luke’s-San Lucas Episcopal church in Vancouver, Washington. Attendance, always high during Curry’s pastoral visits, may grow even bigger with even non-Episcopalians interested in hearing him, though the diocese has not altered his schedule at all to take advantage, said Josh Hornbeck, the diocese’s communications director. The bigger question for dioceses, congregations and parishioners may be whether the attention Curry has brought to the Episcopal Church and to the Reclaiming Jesus initiative will flow down to them in ways that serve the long-term mission of the church and the work of its members. Even if it does, some say there still is plenty of work to be done. That elicited nearly 100 comments and replies, ranging from suggestions for Curry’s next steps to ways individual congregations can follow his lead, such as by expressing his message locally with an authentic voice. Katie Sherrod, communications director for the Diocese of Fort Worth and a member of the Episcopal Communicators group, told Episcopal News Service that the royal wedding generated thousands of page views on the diocese’s website, and the diocese has continued to promote Curry’s sermon, as well as the Reclaiming Jesus procession. It may be too much to expect one sermon – even that sermon – will suddenly compel people to seek out their local Episcopal congregations and fill Sunday services across the land, but Episcopalians have the ability to seize Curry’s message in similar ways, said Woerman of the Diocese of Kansas, who also serves as president of Episcopal Communicators. “American culture seems to be in a lot of strife right now, and just to have a straightforward, powerful message of love … I think that is a message that a lot of people in our society long to hear,” she said. The Rev. Scott Gunn, executive director of the Episcopal evangelism resource ministry Forward Movement, puts it another way. Gunn admits to being swept up in royal wedding fever on May 19, waking up early to watch the hats and hoopla while wearing his own favorite hat, a Cincinnati Reds baseball cap. It didn’t take long after Curry’s sermon to realize the reaction would be huge. He gladly wrote the column. Unfortunately, however, not all churches are equipped to take advantage of a royal wedding moment, Gunn told ENS. That said, he is hopeful that Curry’s royal wedding sermon and his subsequent media blitz will encourage and embolden congregations to improve their own efforts at evangelism. Gunn thought that, even while participating in a lighthearted TV segment, such as on NBC’s “Today” when Al Roker, a fellow Episcopalian, asked Curry to help deliver the weather forecast, the presiding bishop struck the right tone. Curry downplayed his own newfound celebrity in speaking with ENS. “I’m not an actor. I’m not a celebrity. I’m not a movie star. There’s nothing about me that’s really interesting, not more than anybody else,” he said. Even so, the Rev. Frank Logue, canon to the ordinary in the Diocese of Georgia, knew Curry’s royal wedding sermon would be well received, and he set aside time that day to edit video clips of the sermon for the diocese to post on social media. Since then, Logue has followed Curry’s media appearances and noted how the presiding bishop never loses his focus. Even when TMZ asked Curry about the site’s earlier interview with rap star Kanye West, Curry responded in a way that amplified his point about Christian love. Logue, who also serves on the church’s Executive Council, echoed Gunn and Michie in stressing that individual congregations and Episcopalians still need to do the hard work of making connections in their own communities. But it also is remarkable seeing the effect of Curry’s sermon in daily life. “What I noticed right away in the days following, walking around in a clerical collar in Georgia, people kept bringing that sermon up to me. ‘Did you happen to see the royal wedding?’” he recalled. These often were strangers who didn’t even know at first that Logue was of the same denomination as the preacher who had so impressed them. I am so happy that the world got a chance to see what we are really like in America. Bishop Michael did us proud with his message at the Royal Wedding and in how he carried himself during all of the follow up news shop appearances. To top it all off, he led a peaceful protest in Washington. Compare that to a TV preacher bragging about his multi-million dollar jet. Well done Bishop Michael. I was good to hear the Bishop speak out so fervently about the love of Jesus Christ. We need more messages like this. The true message of the Gospels needs to be told more often to the general public. While I liked the PB’s message, more important is that people live the gospel. Having recently left the church after 53 years as an Episcopalian, I have seen far too often that talk is cheap, but actions fall far short. TEC talks a good game, but it lacks the will to turn the words into reality.